Fast Pitch! And the winner is …………….. 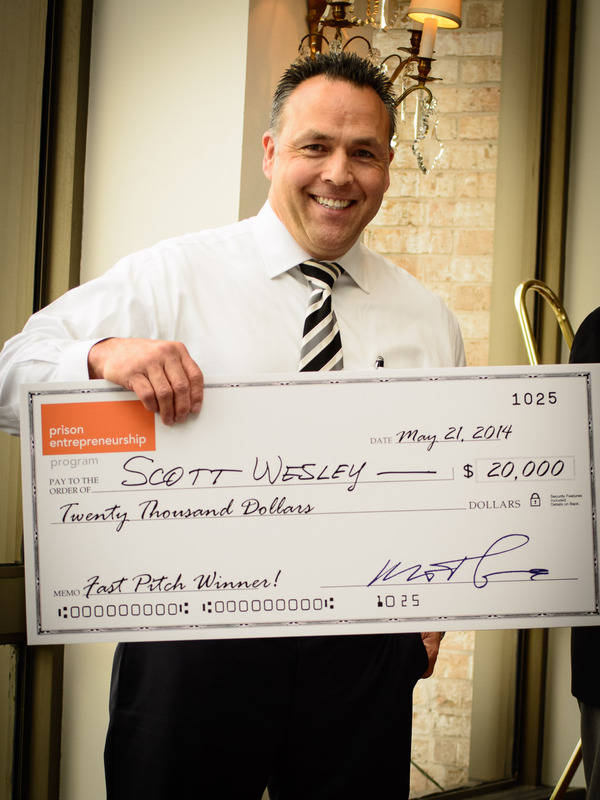 Yesterday, before a crowd of 120 people at the River Oaks Country Club yesterday, the Prison Entrepreneurship Program hosted our first “free-world” Business Plan Competition. After a very tough competition, our audience chose the winner …. Control-Alt-Delete, a tattoo removal service that allows people to overcome “tattoo regret” by taking CONTROL of their lives, ALTERING the way they are perceived by the world (and themselves) and DELETING their old tattoos! If you would like to get involved in helping any of our entrepreneurs with their ventures, please contact us today! As mentioned in this blog from a few weeks ago, U.S. Senator John Cornyn (R-TX) and his wife Sandy Cornyn visited the Prison Entrepreneurship Program‘s Houston office to learn how PEP has delivered some of the nation’s best results in prison rehabilitation. “I was very impressed by the work PEP is doing to provide hope and a second chance to individuals willing to do the hard work to make a positive change in their lives. By promoting personal responsibility and equipping individuals with the education and tools necessary to succeed, PEP is reforming lives and strengthening Texas communities,” said United States Senator John Cornyn after the event. Below are some more photos from the event, which included a press conference during which the Senator described some legislation that he has drafted in response to an increasing awareness of the impact of programs like PEP. Together, we are rethinking prison! U.S. Senator John Cornyn Meeting with PEP’s Leadership Team. U.S. Senator John Cornyn meeting David Medlin, PEP’s Re-Entry Manager, to learn about the Prison Entrepreneurship Program. U.S. 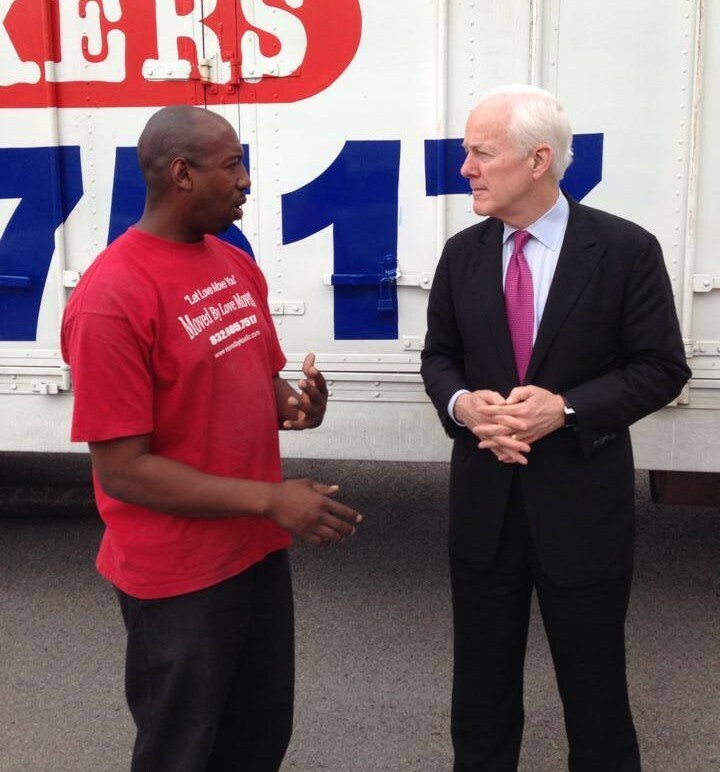 Senator John Cornyn meeting PEP Graduate Entrepreneur, Marcus Hill. The following article was featured on U.S. Senator John Cornyn’s own blog (here) after his recent visit to the Prison Entrepreneurship Program (see prior blogs here and here). Last week, Senator John Cornyn visited Houston to talk about new reforms that would help former convicts start their own businesses. Senator Cornyn hosted a round table meeting with the leadership team of the Prison Entrepreneurship Program (“PEP”) and the Texas Department of Criminal Justice to learn more about how the PEP has fundamentally transformed the lives of inmates post-incarceration. In the simplest of terms, the PEP serves as a business school for inmates, with the goal of turning former criminals into productive members of society. Established in 2004, the Houston-based nonprofit connects the nation’s top executives, entrepreneurs, and MBA students with convicted felons. Senator Cornyn was able to meet with several business owners who have become successful with the help of the Program. ‘The truth is that thousands of people will be released from prison every year, and the question is, do they end up going back to prison?’ said Senator Cornyn, after speaking with PEP participants. You can check out Univision’s coverage of the round table HERE. “I was very impressed by the work PEP is doing to provide hope and a second chance to individuals willing to do the hard work to make a positive change in their lives. By promoting personal responsibility and equipping individuals with the education and tools necessary to succeed, PEP is reforming lives and strengthening Texas communities,” said United States Senator John Cornyn. He further stated that he plans to take what he learned from PEP back to Washington, D.C. The meeting included a tour of our offices as well as a roundtable discussion with PEP’s leadership team, representatives from the Texas Department of Criminal Justice, the Rockwell Fund and RKI (one of the largest employers of PEP’s graduates). One of the highlights of the meeting was introducing the Senator to several of our graduates who are now running their own businesses. This included Cedric H., founder of Moved by Loved, who is pictured below along with a fellow PEP graduate who is now working for Cedric. Several reporters were present for the event, which was followed by a press conference during which Sen. Cornyn discussed “The Recidivism Reduction and Public Safety Act” (which he has sponsored along with Sen. Sheldon Whitehouse (D-RI)). The legislation would address multiple aspects of prison reform, including requiring the Bureau of Prisons to offer programs like PEP to eligible inmates nationwide. Cedric H (Moved by Love) with U.S. Senator John Cornyn and Demetrius J. One of PEP’s 10 Driving Values is Servant Leadership. We believe that the success of our program is not achieved at graduation, but is lived out through the lives of our graduates every single day after they are released. Recently, several of our past participants were able to demonstrate this principle to a group of 150 eighth graders at Hogg Middle School in Houston, Texas. The group included PEP’s Patrick McGee as well a graduates Scott Wesley and Greg P. These three men spoke to these middle school students about what led them into prison and how their lives have changed since they were released.